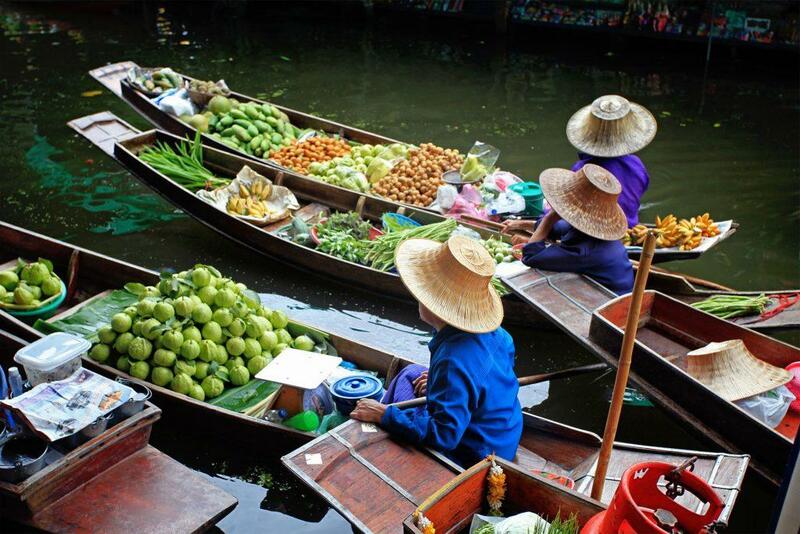 Damnoen-Saduak Floating Market is the most famous floating market in Thailand. It is located 100 km’s south of Bangkok in Ratchaburi province which is a 60-minute journey. It is not easy to get to Damnoen Saduak by public transport from Bangkok. The best way to visit the market is on an organized tour which provides transport. The market opens only between 09.00-12.00 daily. 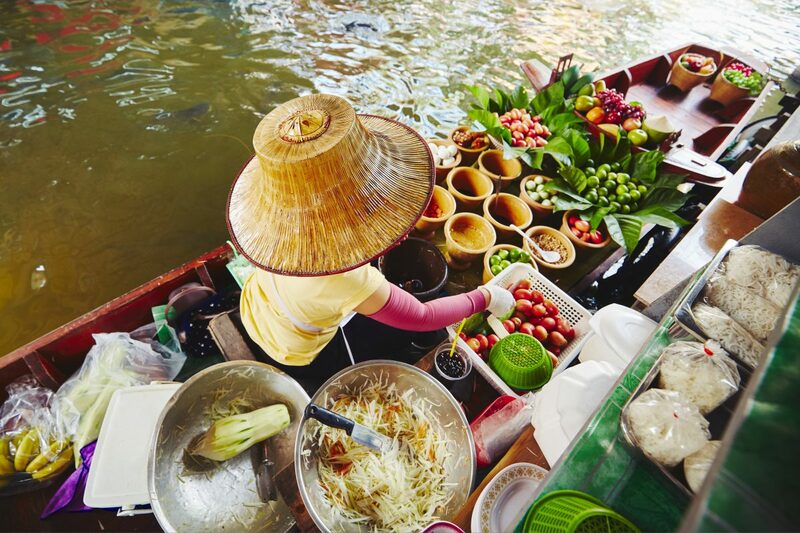 The market features vendors in boats on the Khlong selling fresh fruits, vegetables, various snacks, and BBQ seafood. Most tours transport their clients to the market area by boat from a nearby pier giving you the opportunity to purchase items from vendors while you are on the boat or you can hire a paddle boat for 150 baht to go out on the Khlong yourself. Once on land, there is a tourist market selling clothes, handicrafts and souvenirs and a restaurant area where you can sit down and eat and drink. The tours usually spend about 90 minutes at the market. It’s all very touristy but still good fun and an experience. A half day tour from Bangkok costs as little as 550 baht and a variety of full-day tours are available combining the market with choices from an orchid farm, a Khlong tour, an elephant ride, elephant bathing, the Bridge on the River Kwai, a rose garden, a crocodile farm, a Thai cultural village, and the Maeklong Railway Market. Full day tours start from 1100 baht up to 4400 baht depending on where you want to go. You can book discounted tickets here. *Beware of taking taxis from Bangkok to Damnoen-Saduak. Some taxi drivers are part of a scam where a low-price ride to the market and back are offered. On arrival at the market, you have to buy an overpriced boat ticket for a Khlong transfer. When you return the taxi will have vanished and you will have to find your own way home. The taxi drivers who take part in this scam are the ones who usually hang around outside hotels all day. Always book a tour with a reputable company where all costs are included in the ticket.